SEOUL, Sept. 11 (Yonhap) — The World Health Organization (WTO) has recommended South Korea to adopt more stringent regulations to ban cigarette smoking in public places and restrict tobacco advertising and promotions. The WTO has been issuing the outcome of the MPOWER project assessing the implementation of monitoring, protecting, offering help, warning, enforcing bans and raising taxes every other year to support an anti-tobacco campaign around the world. South Korea was not properly implementing policies on protecting, enforcing bans and raising taxes, according to the WHO Report on the Global Tobacco Epidemic 2017 released on its Web site Monday. “Subnational jurisdictions have the authority to adopt laws that ban tobacco smoking in any or all of the places mentioned above. However, no subnational laws have been reported,” the report said. The WTO calls on member states to ban smoking at all public places to prevent damage from second-hand smoke. South Korea has been expanding nonsmoking zones in public places for the past few years but such measures have fallen short of legislating a far-reaching ban. The WTO also recommends member states ban all forms of advertising, promotion and sponsorship of tobacco while South Korea has been allowing cigarette advertising, promotion and sponsorship to some extent. South Korea, meanwhile, has been properly implementing four other areas in monitoring, offering help, warning and enforcing bans on smoking, the report said. 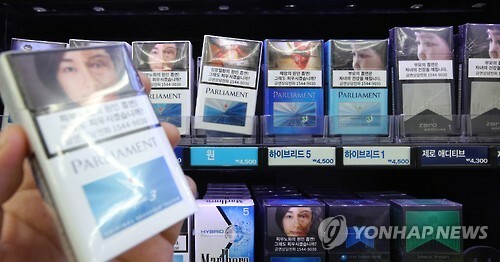 The government increased taxes on cigarettes by 2,000 won (US$1.70) per pack from Jan. 1, 2015, raising the price to 4,500 won per pack, citing the need to discourage smoking. The government mandated tobacco companies place graphic images showing the harmful effects of smoking on the upper part of cigarette packs in 2016. It moreover came up with a new rule earlier this year to require the pictorial warnings to occupy more than 30 percent of the front and back of cigarette packaging. The graphic warning images must be placed on packets of e-cigarettes as well as chewing tobacco. The smoking rate among South Koreans came to 39.3 percent among males and 5.5 percent among women, while that for people aged under 19 reached 9.6 percent for males and 2.7 percent for females in 2015.